The band that has played at festivals and venues across India like ‘Ziro festival of music’, Arunachal Pradesh alongside artists like Lee Ranaldo & the Dust (Sonic Youth, USA), The 7 – Sisters rock festival, Voice of North-East festival, India Bike Week, New Wave Festival Goa, IIT Delhi and more. 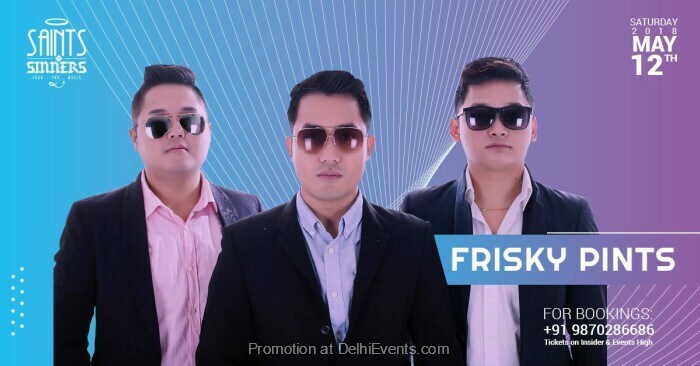 This band also has the credit of being one of the first indian bands to come in the top 25 bands worldwide in the competition hard rock rising which sees global bands competing. The band was handpicked by Uday Benegal (Indus Creed) to jam on MTV as part of the Rayban MTV never hides sounds series and also won the Delhi leg of the Converse roads to rubber contest. Frisky Pints was nominated by Rolling Stone Magazine as one of ‘2013’s best emerging rock act ‘ and MTV Indies included the band in the “10 Immensely Talented Young Bands That Hold Potential to Stardom”.